Subscribe to either FREE or PRO and start using Listen API in seconds. The pricing model is the same to everyone, no matter you are a public company or an individual developer. You can always start with FREE plan without entering your credit card info, then upgrade to PRO plan if necessary. After exceeding the limit, you will be suspended until next month. If your application displays data fetched from Listen API, you must show a "Powered by Listen Notes" logo on at least one screen / page with that data. You can download the "Powered by Listen Notes" logo here. Applications using the Listen API must not pre-fetch, cache, index, or store any content on the server side. 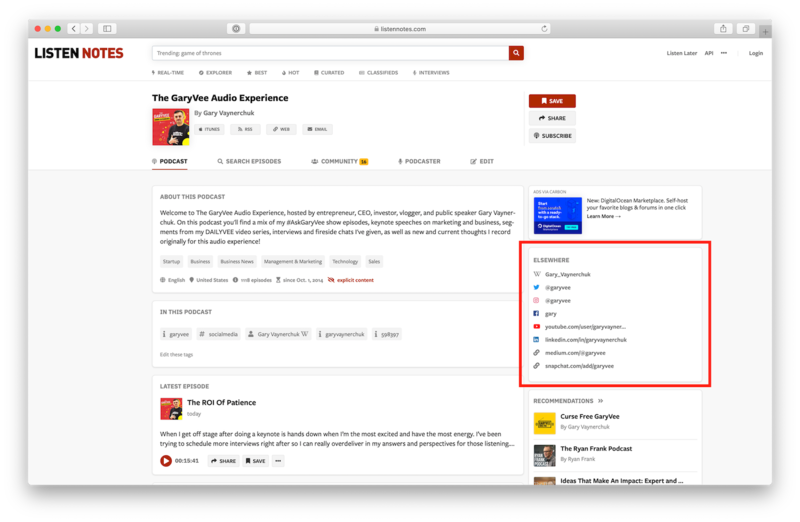 Note that the id of podcast / episode, used to uniquely identify a podcast / episode, is exempt from the caching restriction. Listen Notes, Inc. sets and enforces limits on your use of the Listen API (e.g. limiting the number of API requests in FREE plan), in our sole discretion. You agree to, and will not attempt to circumvent, such limitations documented with the Listen API. In particular, you must not create multiple accounts to get around FREE plan's quota limit. You must not use the Listen API in a manner that constitutes abusive usage, or otherwise fails to comply or is inconsistent with any part of the Listen API documentation located within https://www.listennotes.com/api/docs/, as determined by Listen Notes, Inc. in its sole discretion. 1. Can I use Listen API for free? Yes. We have FREE plan. We recommend you to start with FREE plan and upgrade if necessary. And you don't need to enter credit card info for FREE plan. 2. Do you store my payment info? No. We don't (and we can't) store your credit card info in our database. We use Stripe to handle the payment, just like other companies including Uber, Shopify, Reddit, Spotify, Instacart and many more. 3. What if I exceed my quota limit? If you use FREE plan, then you will be suspended (e.g., getting HTTP 429) when you exceed quota limit (i.e., 10,000 requests/month). Your usage numbers will be reset when the current billing cycle ends. Your API key is always valid unless you reset it. If you use PRO plan, then you will be charged for extra requests beyond the free quota (i.e., 100,000 requests/month). We do tiered pricing, which is similar to many other APIs in the world (e.g., Google Maps API). Please see the pricing details above and try out the pricing calculator. If you downgrade to FREE plan from PRO plan, you will be charged with prorated fees immediately. We update the prorated fee in your API dashboard very 10 minutes. No. We only count requests with successful responses (HTTP 200) into your usage. You also won't be billed with HEAD requests. If we need to refund you (e.g., due to bugs on our side), we will do it via Stripe. You can always contact us at [email protected] for any issues. 7. If I switch to a new plan (FREE to PRO, or PRO to FREE), do I need to update the API key in my code? No. The API key continues to work, unless you reset it. 8. How can I cancel my plan? If you use FREE plan, then do nothing. You won't be charged forever. If you use PRO plan, then please downgrade to FREE plan. 9. I use Listen API v1 (via RapidAPI). How can I migrate to Listen API v2? Actually, Listen API v1 and v2 provide exactly the same endpoints, parameters, and JSON responses. The pricing of v2 is simpler. We hosted Listen API v1 on RapidAPI who handled analytics and billing for us. As Listen Notes grows as a business, we need more customization and flexibility that the 3rd party platform RapidAPI can't provide. Thus, we built Listen API v2 to replace RapidAPI. Subscribe to either FREE or PRO plan on this page. In your code, change the base url to https://listen-api.listennotes.com, change the version number to v2 in all endpoints, and use the new API key in the X-ListenAPI-Key header. You can simply copy the entire endpoint url from the docs page. Listen API v1's response headers X-RateLimit-* don't exist in v2. Instead, you can find response headers X-ListenAPI-FreeQuota and X-ListenAPI-Usage when using Listen API v2. We will keep Listen API v1 up and running. Please take your time to migrate to v2. But all the future improvements will only go to Listen API v2. 10. I subscribe to PRO plan. What if I fail to pay (e.g., credit card lost or expired)? First, we will notify you via email. You should update your credit card info as soon as possible. If we are still unable to charge your credit card within 48 hours, then we have to downgrade your plan to FREE. Don't worry. Your code won't break, because your api key is still valid. You can still use up to 10,000 requests/month with FREE plan. After you reach the quota limit, you'll get HTTP 429 errors until next billing cycle starts. Of course, you can upgrade to PRO plan again with a valid credit card. But you'll need to pay off the previous bill first.